Today, October 1st only, head on over to Zulily.com where you can score this Melissa and Doug Stamp and Sort Mailbox Set for only $18.99 shipped (Retail $29.99). 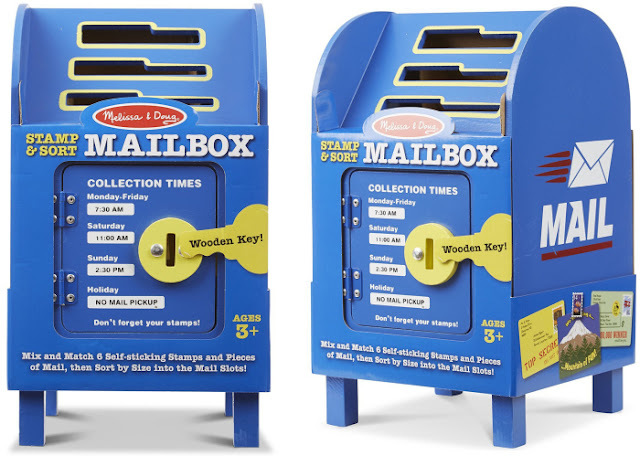 Brightly painted in official blue, this set features multi-sized mail slots to drop in letters and cards, and a locking door with wooden key to play postal worker and collect the mail. The set comes with six wooden pieces of mail and six self-sticking wooden stamps – mix and match the stamps and pieces of mail and then sort by size!